Gulf International Bank B.S.C. (GIB) is a leading pan-GCC universal bank, specialising in corporate and investment banking, with a growing retail footprint. GIB provides innovative, client-focused solutions covering Wholesale Banking, Treasury, Investment Banking, and Asset Management products and services, in both conventional and shariah-compliant form. GIB is focused on maintaining long-term relationships with its clients, setting new and high standards of service and professionalism. GIB is present in key markets, with subsidiaries in Riyadh, and London, and branches in Dhahran, Riyadh, Jeddah, Abu Dhabi, London, and New York together with a representative office in Dubai. 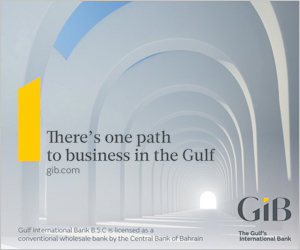 Founded in 1975, GIB is licensed as a conventional wholesale bank by the Central Bank of Bahrain and is owned by the governments of the six Gulf Cooperation Council countries, with Saudi Arabia’s Public Investment Fund being the main shareholder. 2017: GIB successfully launched a US$500 million long five-year bond, the first non-sovereign bond offering in the CEEMEA region in 2017. 2016, GIB celebrated its 40th anniversary with the launch of a new distinctive brand identity to reinforce its vision, culture, and reputation. 2016, GIB was the first and only financial institution to issue a bond in the domestic Saudi Riyal market. 2016, GIB went live with a new online global transaction banking offering. 2016, GIB was one of the first financial institutions in the Middle East to early adopt the new IFRS 9 provisioning guidelines. 2016, GIB won the “Best Debt Bank in the Middle East” and the “Best Investment Bank in Bahrain” awards from the New York-based Global Finance magazine. 2016: GIB was named the “Safest Bank in Bahrain” for the third year in a row by Global Finance magazine. 2015, GIB went live with a complete new information technology systems in all geographic locations. 2015, GIB won the Bahrain Asset Manager of the Year and Regional Equities Manager of the Year as part of the Global Investor/ISF MENA Awards. GIB Capital is a wholly-owned subsidiary of GIB with more than 10 years of experience in providing a comprehensive range of investment banking products and services designed to provide innovative, customised financial and investment solutions for clients. The asset management division of GIB, GIB (UK) manages close to US$13 billion of assets on behalf of institutional clients, making it the largest institutional investment manager in the Gulf Cooperation Council. As a separately capitalised subsidiary located in London, GIB (UK) is authorised by the Prudential Regulation Authority and regulated by both the Financial Conduct Authority and the Prudential Regulation Authority. GIB’s focus over the next five years is to create long-term value for its shareholders, addressing the core challenges of improving the bank’s funding profile, whilst growing and diversifying the business model of the Bank. Moreover, GIB has managed to evolve from a loan-driven merchant bank into a universal bank by diversifying its sources of income with a greater emphasis on fee-based solutions and expanded into new segments and products including retail banking, and transaction banking for corporate clients. The bank has further extended its services launching ‘meem’, a digital retail banking proposition that has helped initiate the transformation of personal banking in the regional market, and which is the world’s first shariah compliant digital service.